Henry Ford, with eleven other investors and $28,000 in capital, incorporated the Ford Motor Company in 1903. In a newly-designed car, Ford drove an exhibition in which the car covered the distance of a mile on the ice of Lake St. Clair in 39.4 seconds, which was a new land speed record. Convinced by this success, the famous race driver Barney Oldfield, who named this new Ford model "999" in honor of a racing locomotive of the day, took the car around the country and thereby made the Ford brand known throughout the U.S. Henry Ford was also one of the early backers of the Indianapolis 500. In 1908, the Ford company released the Model T. From 1909 to 1913, Ford entered stripped-down Model Ts in races, finishing first (although later disqualified) in an "ocean-to-ocean" (across the USA) race in 1909, and setting a one-mile oval speed record at Detroit Fairgrounds in 1911 with driver Frank Kulick. In 1913, Ford attempted to enter a reworked Model T in the Indianapolis 500, but was told rules required the addition of another 1,000 pounds (450 kg) to the car before it could qualify. Ford dropped out of the race, and soon thereafter dropped out of racing permanently, citing dissatisfaction with the sport's rules and the demands on his time by the now-booming production of the Model Ts. Racing was, by 1913, no longer necessary from a publicity standpoint because the Model T was already famous and ubiquitous on American roads. It was in this year that Henry Ford introduced the moving assembly belts into his plants, which enabled an enormous increase in production. Although Ford is often credited with the idea, contemporary sources indicate that the concept and its development came from employees Clarence Avery, P.E".Ed" Martin, Charles E. Sorensen, and C.H. Wills. By 1918, half of all cars in America were Model Ts. The design, fervently promoted and defended by Henry Ford, would continue through 1927 (well after its popularity had faded), with a final total production of fifteen million vehicles. This was a record which would stand for the next 45 years. Ford said, "Any customer can have a car painted any colour that he wants so long as it is black". On January 1, 1919, after unsuccessfully seeking a seat in the United States Senate, Henry Ford turned the presidency of Ford Motor Company over to his son Edsel, although still maintaining a firm hand in its management - few company decisions under Edsel's presidency were made without approval by Henry, and those few that were, Henry often reversed. Also at this time, Henry and Edsel purchased all remaining stock from other investors, thus becoming sole owners of the company. The company remained privately held by the family until 1956, when the family allowed a public offering of a portion of the company without ceding control. By the mid 1920's, sales of the Model T began to decline due to rising competition. Other auto makers offered payment plans through which consumers could buy their cars, which usually included more modern mechanical features and styling not available with the Model T. Despite urgings from Edsel, Henry steadfastly refused to incorporate new features into the Model T or to form a customer credit plan. The Model T's key to success was the fact that it had been made in the assembly line, which allowed for many different cars to be made consecutively, identically and much faster than other hand made vehicles. The cars sales triggered the modern era of vehicles. For the first time everyone could own a car, the downside was that every Model T produced after 1913, (the year the assembly line was created) was painted black because the paint dried a lot faster than any other color. The Model T was a very simple car, as simple as it could be made. One screw held 10 or 20 parts. But that's what made it unique. Henry Ford's assembly line was so unique that it turned the Ford Motor Company into a Giant, (and became a tool for every other industry that creates merchandise in the assembly line, of course the assembly line does not use people anymore, but uses robots) while the other car companies were still stuck with the technologies of the earlier days. By 1928 there were about 30 million cars world wide. Half of these were Ford Model Ts. By 1926, flagging sales of the Model T convinced Henry of what Edsel had been suggesting for some time: a new model was necessary. The elder Ford pursued the project with a great deal of technical expertise in design of the engine, chassis, and other mechanical necessities, while leaving it to his son to develop the body design. Edsel also managed to prevail over his father's initial objections in the inclusion of a sliding-shift transmission. The result was the highly successful Ford Model A, introduced December, 1927 and produced through 1931, with a total output of over four million automobiles. Subsequently, the company adopted an annual model change system similar to that in use by automakers today. On May 26, 1943, Edsel Ford died, leaving a vacancy in the company presidency. Henry Ford advocated Harry Bennett to take the spot. Edsel's widow Eleanor, who had inherited Edsel's voting stock, wanted her son Henry Ford II to take over the position. The issue was settled for a period when Henry himself, at the age of 79, took over the presidency personally. Henry Ford II was released from the navy and became an executive vice president, while Harry Bennett had a seat on the board and was responsible for personnel, labor relations, and public relations. The company saw hard times during the next two years, losing $10 million a month. President Franklin D. Roosevelt considered a federal bailout for Ford Motor Company so that wartime production could continue. By 1945 Henry Ford's senility was quite evident, and his wife and daughter-in-law forced his resignation in favor of his grandson, Henry Ford II. In 1926, Ford instituted the five-day, forty-hour work-week, effectively inventing the modern weekend. In granting workers an extra day off, Ford ensured leisure time for the working class. The "short week" as Ford called it in a contemporary interview, was required so that the country could "absorb its production and stay prosperous". Ford suffered an initial stroke in 1938, after which he turned over the running of his company to Edsel. Edsel's 1943 death brought Henry Ford out of retirement. 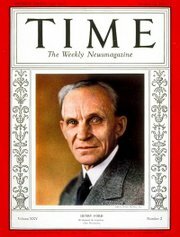 In ill health, he ceded the presidency to his grandson Henry Ford II on September 21, 1945, and went into retirement. He died in 1947 of a cerebral hemorrhage at the age of 83 in Fair Lane, his Dearborn estate, and is buried in the Ford Cemetery in Detroit.